An extract from Laura Blacklow’s book New Dimensions in Photo Processes written by Jesseca Ferguson and Walter Crump. In an age when experience is becoming more virtual, the handmade aspects of photography become more important to the maker and the viewer alike. Contemporary images may be hybrids that combine digital methods with hand coloring, collage, and a nineteenth-century technique or two. In this climate of experimental imaging, pinhole photography offers unique possibilities. Image left: Walter Crump, Bay View, 2004, 20 24 in. (50 60 cm), pinhole photograph. This unique bleached and toned gelatin-silver print (Agfa Classic Multicontrast fiber paper) was contact printed from a fiber paper pinhole negative. The view recorded here, near Crump’s South Boston studio, is from Black Falcon Pier looking across Dry Dock Bay. Photo credit: Walter Crump. Whether you think of your pinhole camera as a sculpture that takes pictures, a recycled object, or a large-format camera, it will be uniquely yours. You can customize, decorate, or embellish your pinhole camera any way you like. The design of your camera, when exhibited alongside the images it takes, can make a visual or political statement not possible with any other imaging method. There are many reasons to experiment with pinhole photography: the incredible distortions you can get in your images, economy, infinite depth of field (all objects depicted are equally in soft focus), multipinholes (allowing multiple views simultaneously, large or unusual formats, etc.). Almost any object can become a camera! Image right: Some of Walter Crump’s home-made pinhole cameras. Please read the Safety section in the book to become familiar with proper handling of darkroom chemistry. Osberve sound safety practices when operating power tools, or working with scissors or mat knives. Orthochromatic film or black-and-white photographic paper. Any film will work in a pinhole camera, but ortho film, as described in this chapter, can be handled under a safelight and is thus a good film to start with. Potential camera. Choose a can, box, or other (potentially) light tight container that will easily accommodate insertion and removal of film or paper. Good examples include paint cans, oatmeal boxes, lunch boxes, purses, suitcases, guitar cases, 35 mm film canisters, garbage cans with lids, etc. Metal tins with tight-fitting lids, such as the ones used to package cookies or loose tea, have a high success rate as first-time pinhole cameras. A conventional camera (any format) can be modified to become a pinhole camera. Simply remove the lens and replace it with a pinhole mounted in light-tight material, such as a lens cap. Mat knife, scissors. These are useful for cutting metal stock for pinholes or for building a camera from scratch out of mat board or cardboard. In addition, you can cut strips of mat board or foam core to act as channels, keeping the film or photo paper in place inside the pinhole camera. Sewing needles or pushpin. These are used to "drill" the pinhole. Emery sandpaper. Sandpaper designed for metal is used to smooth away the burr created when drilling the pinhole. Drill, files. These tools are used for cutting and smoothing holes in metal tins, wooden boxes, or other items being transformed into pinhole cameras. Magnifying glass or photo loupe. These items are used to check your pinhole for roundness and lack of debris. Canned air. A puff of air will clean pinholes of any debris left from sanding. Black photo tape. 1⁄21 in. (1428 cm) wide. Black photo tape blocks light well and, therefore, is good for making a simple shutter or for mending light leaks. Permanent black marker, black acrylic paint. Either item is good for touchups to reduce reflections inside a shiny metal pinhole camera interior. Thick black acrylic paint can patch small light leaks. Watch, notebook, and pen. 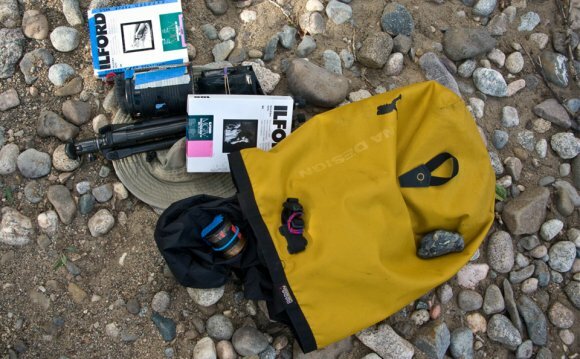 These items help record your exposure times and results. Keeping good records will make your subsequent exposure times more accurate. An ordinary object, such as an oatmeal tin, is turned into a pinhole camera. The interior of the would-be camera is blackened (to cut down on interior reflections). An opening is cut into one side or one end of the potential camera. A pinhole, drilled into a 1×1 in. (2.5×2.5 cm) or larger square of lightweight metal, is taped in place behind this larger opening using black photo tape. A flap of black photo tape is created to act as a simple shutter. Once the camera-to-be is chosen, spray paint the interior matte black (unless the interior is already a dark, nonreflective color). Double check for potential light leaks (such as around the hinges and handle of a child’s lunchbox) and repair them with black photo tape. Next, using a mat knife or a drill bit 1⁄2in. (1.25 cm) or larger, cut a small window in the side or end of your camera, preferably centered (for better image coverage). As this opening will accommodate your pinhole, be sure to make it smaller than the approximately 1×1 in. (2.5×2.5 cm) square of metal containing your pinhole. File and sand down the rough edges around this window carefully, so that your pinhole metal can be taped in place snugly behind it (using black photo tape). To make the pinhole itself, cut an approximately 1×1 inch (2.5×2.5 cm) square of metal, and place it on a piece of cardboard or foam core. Using a sewing needle with the blunt end covered in tape or embedded in the eraser of a wooden pencil (in order to cushion your finger) or pushpin, press down into the center of the metal square until the needle pierces the metal, leaving a burr on the opposite side. Sand the burr down, using emery sanding paper, on both sides of the metal. Reinsert the needle into the hole as needed to drill and burnish the inside of the pinhole by gently spinning the metal around the shaft of the needle. Your goal is a perfectly round hole, free of metal debris, in a smooth metal plane. Holding the metal up to a light source, use a film loupe or magnifier to verify that your pinhole is round and free of debris. Center the pinhole behind the larger opening in your camera, and tape it into place with black photo tape. Attach your black tape shutter flap and you are ready to go into the darkroom and load your camera. Winning can be a simple affair if you know for sure the basics of beating blackjack.